The Aruze Gaming brand has been a “dominant leader” in electronic table games in the Asian casino industry “since the beginning” of the regulated market opening up there, Eric Persson (pictured), president and chief operating officer at Aruze Gaming America Inc, told GGRAsia. The executive also noted that the company’s business performance had not been negatively affected by legal battles between its parent company and the group’s founder, Japanese entrepreneur Kazuo Okada. In an interview with GGRAsia, Mr Persson said that Aruze’s sic bo “is unquestionably the most popular sic bo product in Asia… and our roulette has done well for over a decade. What we are really focused on is refreshing those games”. He was speaking at the brand’s stand at the recent Global Gaming Expo (G2E) Asia 2018, held in Macau. After recently updating its sic bo range with Dragon Sic Bo the firm also has a new version of its roulette electronic table game product that it showcased at the casino industry trade show. “The biggest thing I think people will take from our show stand is… there’s a lot of confidence in our product,” stated Mr Persson. “We are growing aggressively really all over the globe,” he added. “Our sales in Europe have doubled year-over-year. In North America we are up 80 percent for the last nine months, and are up over 50 percent in the last 12 months,” the executive noted. “Asia is another region we are really starting to expand into: all the secondary markets like South Korea and Vietnam. We are doing well in the Philippines. We are going to work them all: Cambodia, Laos. For Aruze really our goal is to be in every jurisdiction where slot machines are sold,” said Mr Persson. 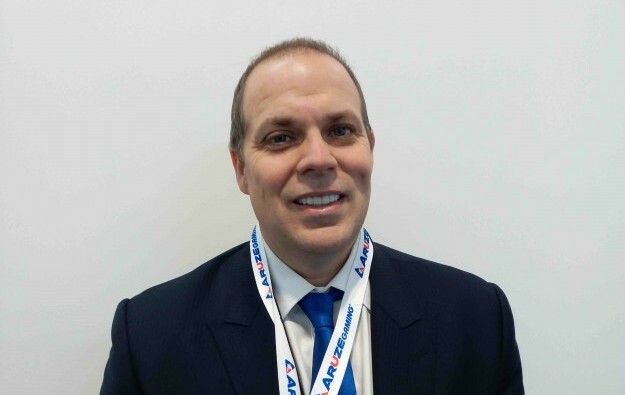 Mr Persson – previously senior vice president of slot operations and slot marketing for casino operator Las Vegas Sands Corp – adopted a number of performance pledges to Aruze customers soon after his move to the gaming supplier. He explained to GGRAsia the thinking on that decision. “At Sands we were the world’s largest slots buyer. It’s a frustrating thing for any purchaser when you go out and buy a US$20,000 slot machine and the supplier puts in software that doesn’t perform, and then they want you buy a new conversion [kit] for a game that doesn’t work,” he said, referring latterly to slot performance. “When I came to Aruze the first thing I did was say ‘If you buy our slot machines, for the first two years, if it’s not doing 70 percent of floor average or greater, we’re going to convert it for you: and we’re going to do it free of charge, and we’re going to make sure you have a game that works,” Mr Persson explained. Despite Aruze’s Japanese heritage – via its founder Mr Okada, who initially made his money via pachinko, Japan’s highly popular arcade game – Mr Persson says Aruze and other Japan-linked casino equipment suppliers are still to be tested in the prospective Japanese casino market. He noted the Japanese firms were nonetheless likely to have a cultural advantage over Western rivals. GGRAsia asked Mr Persson whether patent litigation initiated against Aruze Gaming America by Universal Entertainment Corp – the conglomerate founded by Mr Okada but which ousted him as chairman last year – had been negatively affecting customer confidence in Aruze products. GGRAsia also asked Mr Persson about the investigation into Mr Okada announced by the Nevada Gaming Control Board in relation to allegations by Universal Entertainment of fraud by Mr Okada – which the entrepreneur denies.